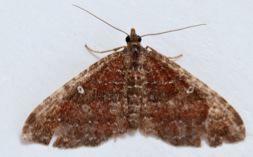 So far summer on Colonsay and Oronsay has been full of sightings both expected and unexpected. We have two new breeding species for the reserve- a pair of sparrowhawks and great skuas. Izzy had a great sighting of two storm petrels off the southern coast while fishing, and a few days ago I spotted a swift flying over our silage fields. 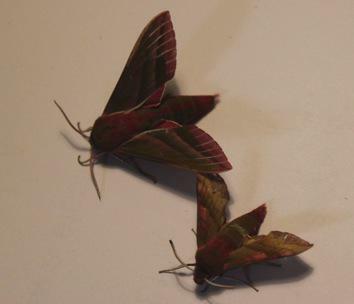 We have managed to do some moth trapping here and were pleasantly surprised to find a small elephant hawkmoth as well the larger and more frequently found (larger) elephant hawkmoth. This was the first record for both islands which is very exciting. 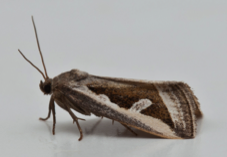 Other first confirmed sightings for Colonsay are gem (a rare Scottish migrant) and silver hook moths found by David Jardine and Ian fisher on Colonsay. On the breeding species front, our pair of gadwall have had 8 ducklings, while we have counted over 80 arctic tern nests between Ghaoideamal and Eilean nan Ròn. While this is a fantastic number by itself, there is also a pair of the rarer little terns nesting here as well. Marsh fritillary butterflies have emerged in large numbers and have been seen all over Oronsay and on Colonsay. They will have laid their eggs for next year’s generation. The machair is displaying a beautiful and extensive range of flowering plants. With a constant buzzing from insects and wonderful bird song. In particular, orchids such as lesser butterfly, northern marsh, early marsh have been flowering in great abundance. It has been lovely to see 4 spikes of the pyramidal orchid in a fenced off shell midden. Chough chicks have began to fledge and can be seen flying in family groups. Corncrake surveys so far have indicated that are numbers have increased from 2013. With early arrival and plenty of spring vegetation cover for them they are likely to do well. The other day I was lucky enough to see a chick- all black fluff and thick bill hiding in the grass just 1 meter away! Izzy got a great view of a juvenile corncrake feeding in the grass – see picture. 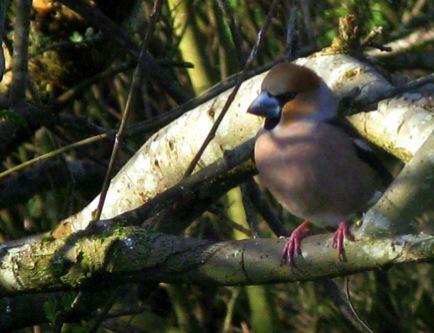 As mentioned in the wildlife notes in a previous edition, a hawfinch was seen on Colonsay in Phil and Carrie’s garden. It was great for us to see such a striking photograph. I though it was definitely worth putting in this month’s article for all to see!